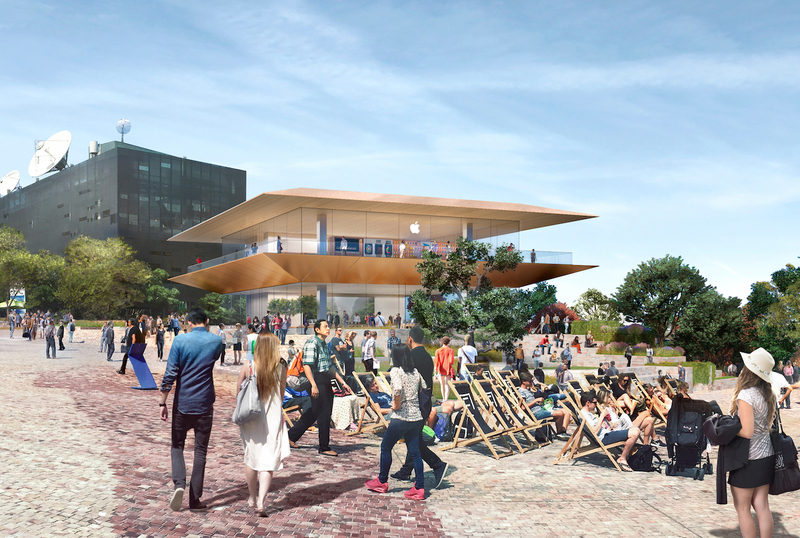 On Tuesday, Apple revealed plans for a global flagship store in Melbourne, Australia. Slated to take the place of the existing Yarra building, which currently houses the Koorie Heritage Trust Gallery, Apple’s global flagship features a futuristic pavilion architecture with wrap-around glass walls on both levels and balconies with glass railings, overlooking the city and nearby Yarra River. The planned store appears to sport an angular metal roof, similar to other recent flagships like the recently opened Michigan Avenue location in Chicago. Metal cladding and stone flooring, another material often used in recent Apple builds, complements adjacent buildings. Construction of the new flagship is slated to begin in 2019 and will generate several hundred jobs. When completed in 2020, Apple Federation Square will be powered entirely by renewable energy and will support more than 200 new Apple retail employees.